One of my favorite things so far about fall is dropping some oils in the diffuser to create fall smells. I was never really a candle type of gal, but I did love a good holiday scented candle. I have been experimenting the last few weeks with several different yummy blends to help you create fall smells within your home. 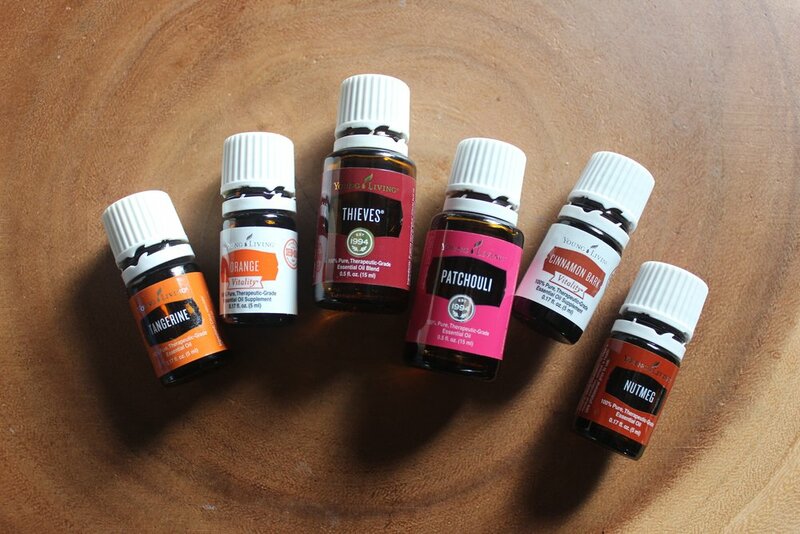 These oils are easy to grab and the good news is that most of them are SO super inexpensive. Like under $20 -- what what. Part of the fun with oils is to blend different scents together in the diffuser to create smells you enjoy. Obviously with Young Living essential oils that we use, there are many therapeutic benefits available. From emotional support to sleep support, mental clarity and so on. Oh and to um, cleanse and purify the air -- amazing! But sometimes you are just focused on creating a certain smell within your home and if you're like me, you're all about the holiday scents right now. Did you know that burning a regular ole' candle for about an hour has the same harmful affects as smoking one cigarette? Mind blowing I know! (*soy candles and beeswax candles scented with oils are usually safe!) This is why it is a great time to get rid of the candles and begin a healthier journey! And in case you're wondering, yes Plug ins and air fresheners are POISON. Toss those bad boys and stick with something natural. Let's chat fall blends shall we? Pour some hot apple cider, grab a knit blanket and cozy up with these! 5 Drops Thieves. 4 Drops Patchouli. 2 Drops Tangerine. 5 Drops Nutmeg. 4 Drops Orange. 3 Drops Cinnamon Bark. 5 Drops Thieves. 4 Drops Orange. 5 Drops Cinnamon Bark. 4 Drops Nutmeg. 5 Drops Nutmeg. 3 Drops Cinnamon Bark. 1 Drop Patchouli. Mix them up and find your own favorite fall scents! Add the drops you wish to, my measurements are just recommendations. Look forward to this post continually growing as we discover new yummy, fall scents.